If you’re like most business owners and managers, even though you‘re opening a new business or getting an old emergency preparedness system up to code, you still have several other things on your plate. However, making sure your building is up to code is not only extremely important because your local city or county government could close your business, it’s also important to protect your guests, customers and staff. Many people stay compliant because it’s the law. However, there’s a human factor involved. Businesses should strive to be compliant because they want to keep people safe. 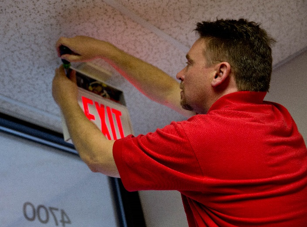 Though many local governments are starting to adopt national standards, local territories are still allowed to establish their own building codes as long as they’re approved by the National Fire Protection Association (NFPA) Standard 101. In the 2000’s criminals began prying open doors from the bottom so they didn’t disrupt panic bars. Thieves were then able to enter stores and do whatever they wanted, because the panic bar was often the only line of defense small businesses had. Therefore, new panic fixtures have several parts including panic bars with multi-point locking systems and heavy-duty latch guards, making them more secure than their predecessors. Signs can come in electric glow or plain designs. Egress is just another word for “exit.” So you want to ensure that all your exits are properly lit at all times. This typically means that you need a backup source to power your egress lighting in case of an emergency. Your lighting must also be bright enough for people to see, but not so bright that it makes it difficult to read.